A new report published in the US journal Science, led by the Chinese Academy of Sciences, suggests the world’s oceans are warming 40 percent faster than what a UN panel predicted five years ago. Although data collection is more accurate than in the past, some experts advise against jumping to hasty conclusions. About 93 percent of excess heat trapped around the Earth by greenhouse gases that come from the burning of fossil fuels accumulates in the world’s oceans. The UN Intergovernmental Panel on Climate Change (IPCC) says ocean warming has led to rising sea levels and contributes to increases in rainfall intensity, more violent storms and the destruction of coral reefs. t is also a threat to biodiversity and one of the earth’s major food supplies. Their report relied on four studies, published between 2014 and 2017 whose conclusions are based on measurements recorded by a fleet of some 4,000 floating robot monitors called Argo. The robtos drift throughout the world’s oceans, every few days diving to a depth of 2,000 meters and measuring the ocean’s temperature, pH, salinity and other information. Argo "has provided consistent and widespread data on ocean heat content since the mid-2000s," the report said. And if nothing is done to reduce greenhouse gases, "models predict that the temperature of the top 2,000 meters of the world’s oceans will rise 0.78 degrees Celsius by the end of the century," it said. There are, however, a number of issues which rather undermine Hausfather’s hype. 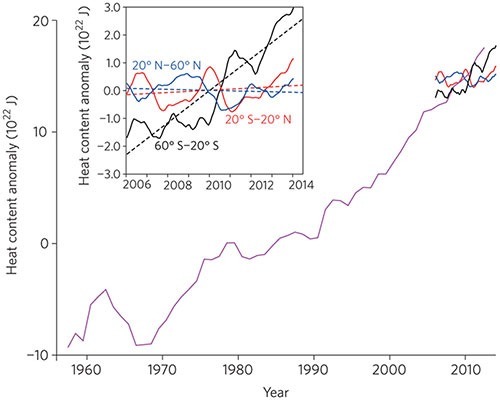 For a start, ocean heat content (OHC) is not rising faster than before, simply faster than scientists guessed a few years ago. There is a big difference between the two. “I think you’ve got to be very careful when splicing together two sets of data from two sets of instruments and trying to compare them”, he told RFI, referring to the fact that the study in question pulled together measurements from before the Argo system was up and running. Amen to that! There are still huge uncertainties in the measurement of OHC, even with Argo buoys. Prior to 2006, we really don’t have a clue. To splice the Argo data onto the prior numbers is not proper science. But we can delve a little deeper. Willis Eschenbach wrote a very thoughtful piece on WUWT in 2014 about OHC, which is still highly relevant. It is worth reading in full here. With thanks to Willis, I will re-use some of his numbers and concepts here. The first thing to note is that, up to 2014 at least, OHC has only risen in the southern extratropical ocean. The tropics and northern extratropical ocean have not warmed at all. Any claim that OHC is rising as a result of GHGs surely has to explain this inconsistency. Willis also raised the question of error margins. As Hausfather’s own graph above shows, these are substantial. Indeed when margins of error are factored in, we have no way of knowing whether OHC has risen at all since 2006. The global Argo dataset is not yet long enough to observe global change signals. Seasonal and interannual variability dominate the present 10-year globally-averaged time series. Sparse global sampling during 2004-2005 can lead to substantial differences in statistical analyses of ocean temperature and trend (or steric sea level and its trend, e.g. Leuliette and Miller, 2009). Analyses of decadal changes presently focus on comparison of Argo to sparse and sometimes inaccurate historical data. To pretend that the data is accurate enough for the purposes claimed is ridiculous. To put this concept into perspective, you may note that the Hausfather graph uses zettajoules on the y-axis. One zettajoule is a billion trillion joules, an impressive sounding number, but one that makes no sense at all to most people. As Willis commented, a linear trend of 0.02C per decade is hardly scary. But more importantly, it simply is not possible to measure the heat content of the world’s oceans to such an accurate degree. Willis in another post, here, concluded that the claimed error margin of +/-0.003C had been badly underestimated. Hausfather claims that recent observations “tend to agree quite well with climate model predictions”. I suspect that was the real objective of the exercise all along. What I don’t know, and it does trouble me given 3: is why your readers continue to give their money to the ‘scum’ at the BBC. because we get put in (or at the very least threatened with) prison if we don’t pay the licence fee! I would certainly not be paying it, if it was voluntary, sadly it is just another tax and just like many of the taxes I pay it is spent in supporting left wing causes that I do not support. Some would say that payment of the licence fee is actually more thoroughly enforced than many serious crimes, especially if you happen to be a white, tax paying member of the middle class living in your own home. Apologies if this sounds racist or far right but it is just the way I and many of my friends and family feel. Watch videos, netflix, amazon, stuff on the web et al. Don’t ever watch live TV, even via the web. Don’t access video on iPlayer (ITV catchup is OK) Untune your TV and disconnect it from the aerial. Now you can legally stop paying TV tax. Tell the TV licensing people from Crapita to stick it. I wonder how many young people pay a TV license? Once their parents are gone, and allowing for the growth of online content, I guess many will not think it necessary, in the same way as they do not think a telephone landline Is necessary. The BBC shutting up for lack of money! What a lovely thought to sleep on. I am presently in a friend’s holiday flat which has no TV, reading a book published in 1905, which I downloaded, watching an old Hancock sitcom, and expecting to go to sleep with the radio playing Classic FM. Fortunately, I rid my home of TV on February 1, 2013. My contract was up in January, however, I kept it one month longer in order to watch my high school band in the Pasadena Tournament of Roses Parade on New Year’s Day. Although I expected to “miss” it for a month, I did not. Gradually, I had stopped watching almost everything and had not watched any network TV for 30 years. I read books and other things. Between Rush Limbaugh and local radio news, I was very aware of what was happening. Since that time, I use my laptop and youtube. I watch President Trump rallies and speeches that way and avoid talking head “opinions.” I am able to keep up with several trusted political commentators, such as Sean Hannity and others, that way. You drive a decent vehicle Mr Mud ! However, as has been said you don’t need a licence unless you do either/both of two things, 1 watch TV off-air 2: watch the scummy bbc iplayer on-line. Anything else is free, and Netflix, Prime and other on-line services cover all you’ll need. If you want to check up that the BBC is still spouting it’s distorted political/AGW bollox you can turn the radio on once a month – they will be, but you won’t be paying their wages. Hi Adrian, Joan, Dave and Emrys. Thanks for the replies. Sadly I have to pay the TV licence because I have a wife and three kids who DO watch live TV. To be fair, I have no issue paying a licence to use receiving/transmitting equipment, after all I happily paid my CB licence for decades. My issue is purely down to the money going to the (B)iased (B)roadcasting (C)orp. I would much rather the government reduced the licence fee to £20 a year and stopped all funding to the BBC, forcing them to be commercial like ITV, Sky etc. If the BBC want to continue making biased propaganda that is fine, just as long as it is funded by people who actually watch them. I don’t watch the BBC at all, and even my wife and kids only watch a few hours of BBC programs each month so we are not getting very good value for our money. I don’t think people realise that any terrestrial TV channel requires a licence fee, not just BBC. Even if you only watch Sky or ITV you still need a licence fee, even though the bulk of that fee goes to the BBC! The BBC tracks you via TV sales. Retailers report name and address of TV purchases (BBC never had detector vans – they were bogus). Hence my kids and others bought their TVs via me. They dont pay licence taxes and not checked up on. One licence can cover many households. They used to as I recall a form being produced in Sainsbury when I bought a TV there years ago. I quickly used a bogus address for a town where I worked. A later purchase in Richer Sounds didn’t include this. The majority of convictions are because they can see the TV on through the window when they visit. I think that the second Willis post completely destroyed any arguments about ocean warming. Nobody has ever explained how greenhouse gases result in warming of the oceans. Only the sun (plus underwater volcanoes) can do that and clouds determine how much solar energy enters the oceans. The study being cited is in disagreement with the ENSO SST data. There is no statistical correlation between our addition of CO2 to the atmosphere (Mauna Loa) and the NINO 3.4 temperature indices derived from the Met Office Hadley ENSO data. What the study does seem to suggest is that the models being used are poor at reliable predictions, even after adjustments to the models and the data put into them. It may be worth adding that Mr. Hausfather tried to debunk the “hiatus” in an earlier study. Having spent most of my working life measuring temperature, salinity, pressure and tidal height of sea water. Anyone says they can measure sea level changes in a mm scale or temperature in the 0.02 of a degree is waffling. Which raises the question as to the accuracy of the sensors. I have heard that there were of fantastic accuracy when calibrated in an air-conditioned laboratory, but that was years ago. What checks are made on these instruments? A typical portable tide gauge will give you a precision of 1mm and an accuracy of +/- 10mm under optimal conditions. …is a preposterous, physical impossibility. This isn’t science. It is obsessive-compulsive neurosis. I mean the comment literally since I do actually understand how the fear messes up rational thought. I see that the report got a quote … from a grad student! Is this a joke? I do not want to be snobby…but really! Oceans warm but not via ‘greenhouse gases.’ Time to revisit the most excellent article explaining ocean warming and cooling. I probably read it first here a few years ago! Thanks bobn, yes that was part of the Climate Water Wheel post back when I started to realize the Oceans Make Climate. Extremely interesting apropos of (a) Trump’s effectiveness by simply being awkward, and (b) pricking unsustainable bubbles. In fact, this is GOOD for ordinary Chinese if it reins in the hubris of their rulers. That statement suggests that the models are not very good at making reliable predictions, even after adjustments to the models themselves and the data being put into them. But, the study being cited disagrees with the ENSO 3.4 data (Hadley). There is no statistical correlation between Mauna Loa CO2 and the NiNO 3.4 SST indices. Ah, yes. The old Michael Mann trick – splice together two disparate data sets and make specious claims. Been there. Done that. Two points: peopke are persuaded by the direction of change, not the magnitude. So it goes up is good enough. The magnitude and how it is related to danger is another issue which is handily not addressed. Been thinking about the error bit. 4000 measurements every 10 days in different places. The error of the acerage is the same for that if each one, right? Because different thing measured. 3 per month, all in different places, same error bar, right? Reducing errors by square root is only legitimate if measuring device and thing measured are stable, right? Next, regardless of the average temp, each measurement is considered representative of 300 km2 (Willis). Is true? What is the actual variation by area in temps at the measured depths and by time – 10 days later are changes real gps-wize because the 300 km2 circle shifted? More error that don’t go away. So actual temps maintain big error bars. Never go away. The SST work is all about statistical work on the anomaly. The movement if the mean. The absolute temp error bar disappears! But what is the error bar on the anomaly? Square root function or more? Has Willis conflated reducing the two? I am wondering if he has. And I now realize the importance of the error analysis course at university I slept through…. Temperature anomalies are useful to the scientific community to examine minute changes. In the case of climate change these measurements are presented on ‘squashed’ graphs so they fit on computer screens and the printed page. Were the X and Y axis faithfully presented temperature changes would be shown as largely a flat line and viewers would be forced to scroll right and left on their computer screens to view them, and all they would see is said flat line. The MSM irresponsibly reproduce anomaly graphs without explaining this to the public and ill educated muppets like me get suckered into believing the planet is melting. This is a completely false statement. Have you ever tried boiling a pan of water with a blow Lamp played on the surface? The physics is simple: Incoming radiation evaporates the surface of the water at the rate of 680Watthrs per kilogram and the resulting vapor rises up back into the atmosphere, along with this Latent Heat. – all at constant temperature. A very small proportion winds up just beneath the surface. This is the major process by which animals keep cool; by sweating. Scientists that make statements about the oceans like that should be sacked as totally incompetent. Don’t these scientists know why they sweat? Who on earth peer reviewed this paper? In a word ‘everybody.’ The list of authors should run to tens of thousands. It is merely a standard artillery stonk from the industry. Actually, the authors do not seem to have noticed (or do not care) that the recoiling gun runs over their foot. Since the ocean is in terms of heat capacity 1600 times more important than the atmosphere, by saying that there was little ocean warming until 2000 they are saying that global warming did not START until 2000. The suggested present uptake of heat energy is enough to increase all the temperatures in the whole system by 1/1000 of a degree C per year. If that is so, who gives a fig? Also is the industry really suggesting that the sun sometimes pours more energy into the sea and sometimes for some inexplicable reason changes its mind over a brief period of a year or two? It is also interesting that – yet again – the ‘evidence’ is far away where nobody can see for themselves, and we are supposed to just swallow the bald assertions. One could write a book about the travesty of this Ocean statement driven by the malpractice of the SatanicCO2 Meme. It is tragic how academia appears hell bent on destroying its reputation. The peer review process now lies in tatters. The Chinese have to keep up “evidence” for the scare so suckers around the world keep buying their solar panels. Clear sky and direct solar energy over the ocean from about 40°S to 40°N will warm water. If there is another significant mechanism, it must be hidden. No one has explained how CO2 warms the World’s ocean. 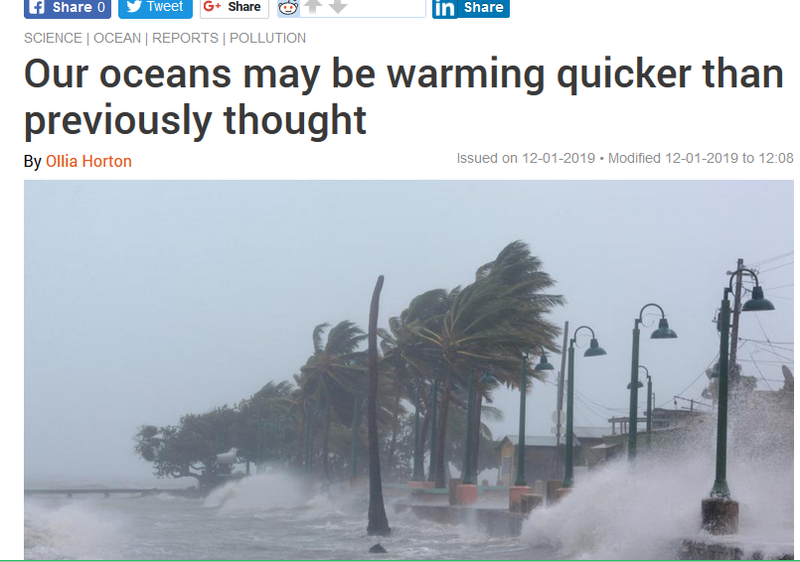 More ocean going churn from the climatastrophist BS factory.